Indian-American Sukanya Roy has proved she is far from a machine. She has just won the 2011 Scripps National Spelling Bee. Fourteen-year-old Roy, from Wilkes-Barre, Pennsylvania, spelled ‘cymotrichous’ correctly to win the Bee. ‘Cymotrichous’ is an adjective which means having wavy hair, Scripps National Spelling Bee Live Blog reported. Roy, an eighth-grader at Abington Heights Middle School, admitted she knew the word and burst into a huge smile while finishing it correctly during the competition. “She was a spelling machine … and when she finally broke through and won, we found that she was far from a machine,” the organizers said. It was Roy’s third trip to the national spelling bee and with this win she becomes the fourth consecutive Indian-American to win the Bee, and the ninth Indian-American in the last 13 years. The National Spelling Bee featured 275 spellers advancing to Washington, D.C. for a competition that started with a written test on Tuesday. Spellers who did well enough on the written test advanced to the two oral rounds on Wednesday, followed by the semifinals Thursday morning and finals Thursday night, carried live on ESPN. 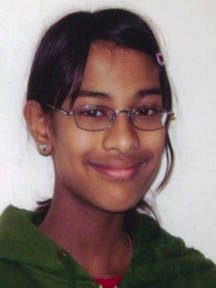 Sukanya is musically inclined and has played piano for almost four years. She also enjoys rock-climbing and roller-skating. She takes classes in karate and holds an orange belt. In her spare time Sukanya may be found exploring the woods or reading and writing fiction stories. Greater Voice wishes her best as she hopes to someday become an author. The champion Roy takes home more than $40,000 in cash and prizes. Next Singing-Dancing Prohibited @ Raj Ghat after Sushma Swaraj Jig !